Winter is coming and when you start talking about heater efficiency and saving money, you’ve really got my attention. I live somewhere in the United States that gets really, really cold during the winter, and it’s not uncommon to wake up to outside temperatures well below 0 degrees. On top of the cold weather outside, it’s a rental house – so there is only a minimum amount of things I can do to make the house itself more energy-efficient. I could run the oil burner in the basement all day and night, but then I would have to pay an oil bill that would probably equal the cost of the rent. Is that what you do too? Fortunately, there is a better alternative. You could figure out a different way of heating that A. uses less energy, B. costs less money, and C. keeps you even warmer than an oil burner would anyway. You could heat yourself not your home. And that’s where space heaters come into play. The idea that we have to heat our entire home all winter long is crazy. Why pay to heat all that empty space you aren’t even occupying? Of course, we don’t want our house temperature dipping below freezing as we don’t want pipes to burst or our belongings getting ruined. But there is absolutely no need to keep an entire 2,000 square foot home a toasty 70+ degrees, especially if you are at work all day or on vacation for a week. Instead of using all that energy to heat up empty space, the best thing to do is to heat yourself not your home, the way that the Japanese do. They don’t use central heat to keep themselves warm; instead, they use different kinds of space heaters which move with them throughout their home. Right now, electricity rates are much cheaper than oil, propane, or kerosene. Natural gas is low too, but again, if you have natural gas you are probably still using a forced-air system to heat your entire home. So a space heater, plugged directly into a wall socket in the very room that needs heating, not only reduces the amount of fossil fuels you burn but is also much more efficient at keeping you warm, rather than your house. I currently own three space heaters for my home – one for the bedroom, one for my office, and one that goes behind the couch in the living room. All of them are only turned on when I am in the room I am hanging out in, and my oil-burning furnace stays set at a much less expensive 60 degrees. Running a space heater while keeping the oil burner set so low means my heating bill in “cold country” isn’t sky-high like most people’s is. The last one I purchased, the Eco-heater 602 High-Efficiency Electric Panel Heater, goes behind my couch and keeps me warm anytime I am watching TV or reading a book. No need to heat the upstairs guest room if I am downstairs watching TV, right? If you live in a colder climate, I highly recommend you pick up a space heater or two for your home. 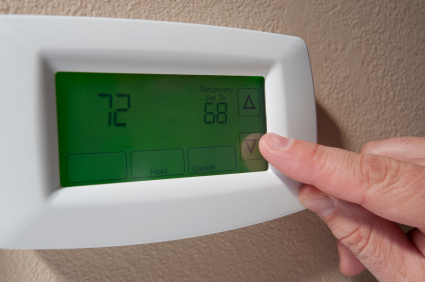 Heat yourself not your home isn’t just a catchy phrase; it can save you a ton of money on your heating bill. Would you rather have a $400 oil bill every month or another $25 tacked on to your electric bill from space heaters? It saves money, saves the environment, and also helps to keep the air inside your home free of the dust particles that often come from forced-air heat. The choice is kind of a no-brainer. I totally agree! We keep ours low, although not as low as we used to since we now have little children. But everyone just needs to bundle up this winter. It’s time to break out the heaters and the Snuggie! I am a big fan of slippers and magic bags and heavy sweaters. They do me just fine in winter. We keep ours fairly low and have everyone bundle up. We also have a fireplace that we use quite a bit that does a really good job of heating up the majority of the house. I grew up with a fireplace and we used it all winter long. It was so warm and relaxing and I loved the smell. Space heaters are great. The one I have I got for free – they weren’t using it. It’s great for that one room (usually the bedroom!) that just won’t heat up. We have one too and really like it. It gets a room warm fast. Do you guys leave your space heaters on in your room overnight? I’m thinking about that, but people are telling my central air gas is cheaper than my electric space heater. I donno! I guess it would depend on your prices for different power sources. Where I live electricity is much cheaper than gas. Plus it is hydro powered so more eco friendly too. I think this is a great option for people. Even if they’re not in extra cold locations, this can still save money. And people should put on a sweatshirt when their inside, too, it’s ridiculous to wear t-shirts in winter and force the heat up to keep you warm! I agree. People need to dress for the weather. You can still be warm and fashionable. I love space heaters. Especially, the electic radiators when you are trying to save on the heating bill! We have radiators too. I find they have a nice even heat unlike furnaces. I have tended to avoid space heaters, but do try to turn down the heat when I’m not home. Also, at night, it can be nice to sleep in a cooler home while throwing on an extra blanket! As long as we aren’t making life uncomfortable, I’m all about such savings. We keep our bedroom cool too. You get a much better quality of sleep that way. I live in a poorly insulated rental one bedroom. While I’m home, I heat the main room and bedroom to 62 degrees. When we’re gone we turn the heat down even lower. 62 might seem cold but we got used to it really quickly, just pile on the sweaters and blankets! Our heating bill has been pretty reasonable so far. That is pretty low but if you can make it work that is great. The sweaters and blankets are much cheaper and greener options. We may just get a space heater for our living room this year. I always thought they were more expensive, but it makes sense to heat a small area rather than an entire house. If you get one, let me know how you like it. It’s starting to get cold here, and I usually leave the electric heating on in whichever room I’m in. During the day I’m usually in the home office so I’ll leave it on there, and in the evening we’ll heat up the entire condo for a few hours. At night, just the bedroom since that’s all we need then. The good thing is that temperatures won’t drop TOO far even with the heating off, but I can’t stand less than about 22C if I’m just sitting down and typing away, as my extremities will start to get cold otherwise. We try to do the same thing. We keep our bedroom cool for sleeping and our basement cooler for working out. The rest of our house is pretty average. I find if you do get to much below 20 your extremities do get cold. This is where my slippers come in. I love having big windows. I really need the sun. We have them in our house. They aren’t great for heat loss but to me it is worth it. We are set on a budget for our heat so always have the same bill which makes things easier to manage. When we go on holidays we turn the house to 16 while we are away. It seems to work ok and the fish and plants don’t fair too bad.